Fettuccine (literally "little ribbons" in Italian) is a type of pasta popular in Rome. It is a flat thick noodle made of egg and flour wider than but similar to what's called tagliatelle elsewhere in Italy. Fettuce is a wider version of fettuccine whilst fettucelle is thinner. Left: Fresh fettuccine da casa. 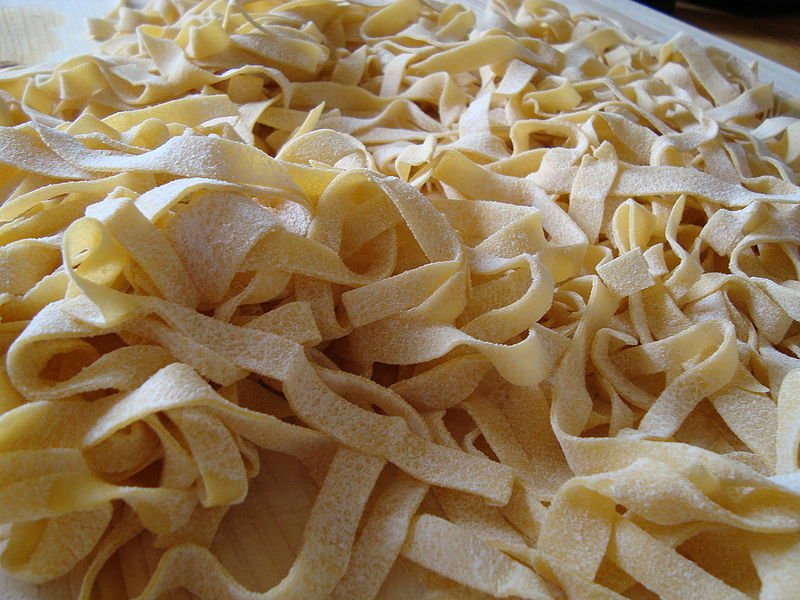 Fettuccine is traditionally made fresh (either at home or commercially) but dried versions also exist on the market. A popular fettuccine dish in North America is fettuccine alfredo. Fettuccine alfredo is a pasta dish made from fettuccine pasta tossed with Parmesan cheese and butter. As the cheese melts, it emulsifies the liquids to form a smooth and rich coating on the pasta. It was named by an Italian restaurateur at his restaurant Alfredo alla Scrofa in Rome. In US cuisine it may be mixed with other ingredients such as broccoli, parsley, cream, garlic, shrimp, and chicken. To make it a single-dish meal, chicken and vegetables are often served on top. Another variation uses egg in combination with cream, butter and cheese. Alfredo sauce is often sold as a convenience food in many grocery stores in the United States. Unlike the original preparation, which is thickened only by cheese, these versions may be thickened with starch. 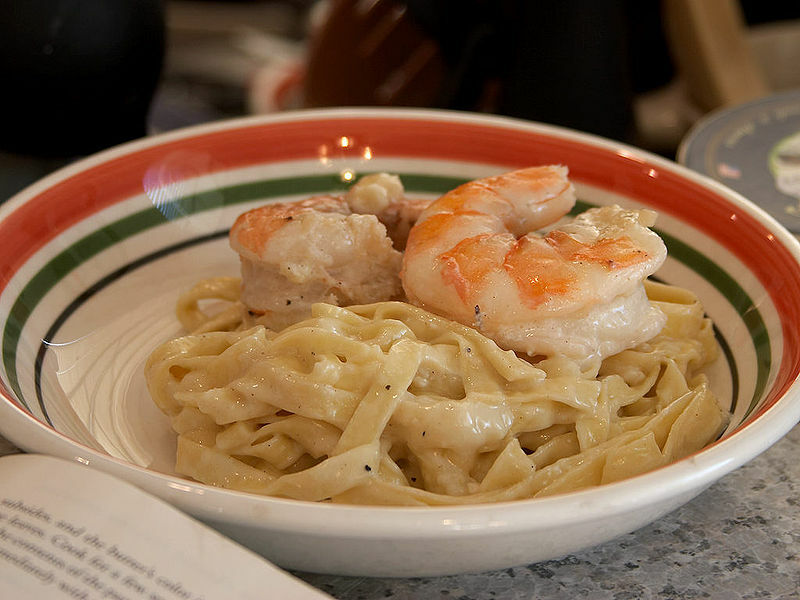 Left: Fettuccine alfredo topped with prawns. Fettuccine Alfredo has become ubiquitous in Italian-American restaurants in the United States. In Italy, the name "Fettucine Alfredo' is basically unknown although it is widely known as "Pasta al burro (with butter)" in south of Italy, where it is more usual to dress pasta with oil, and "Pasta in bianco (in white)" in the north, where it is more typical to dress pasta with butter. Generally butter quantity is usually less than in the American version and the cream is rarely used.